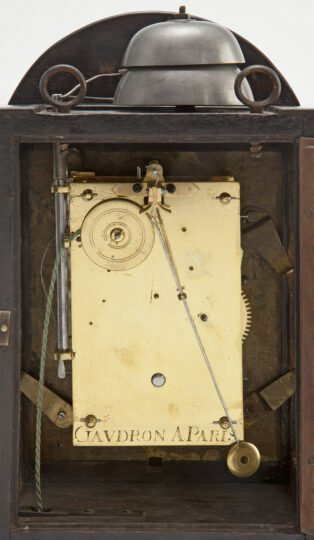 The spring-driven eight-day movement has a going train only, with pull-quarter repeat on two bells. The going train of this religieuse has verge escapement with a short pendulum between cycloidal cheeks. The repeat indicates the quarter hours first on a high-pitched bell with two hammers followed by the hour strike on a larger bell. It is activated by pulling a chord. 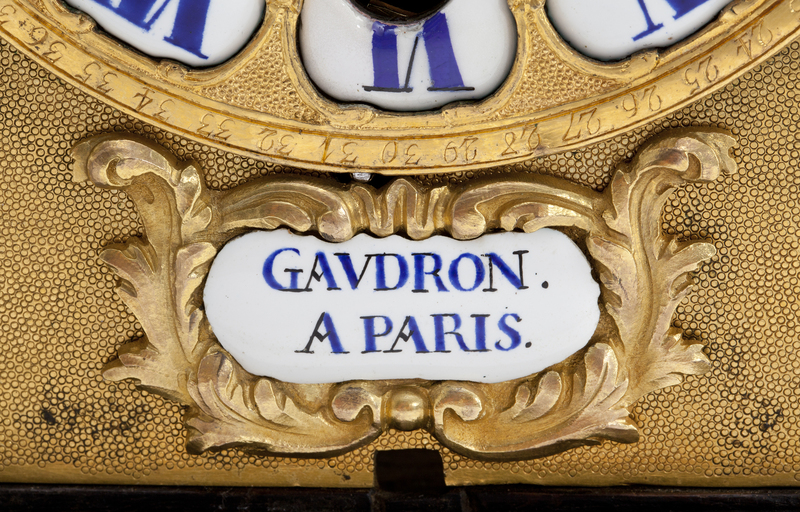 The backplate is signed: GAUDRON APARIS. The matted gilt-brass dial plate has a circular gilt cast-brass dial with twelve enamelled cartouches with blue Roman numerals. 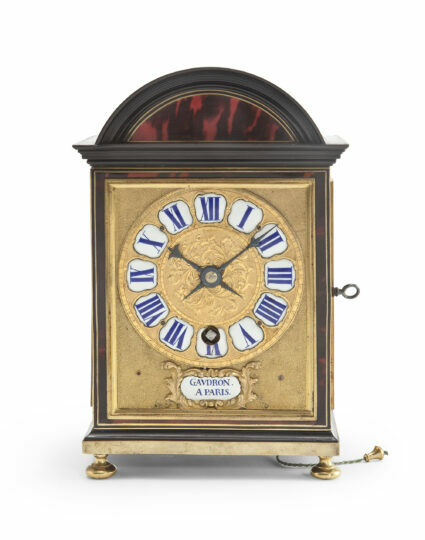 The quarter-hour divisions are cast in the dial whilst the Arabic minute divisions are engraved on the burnished outer ring. 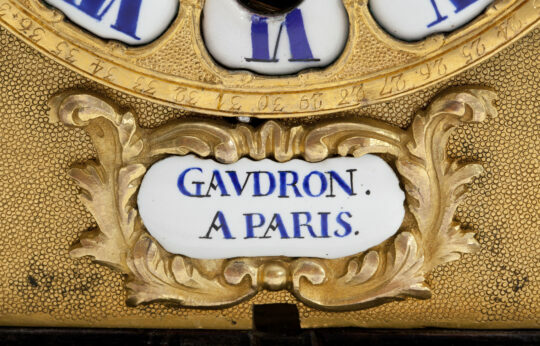 Below is an enamelled signature cartouche in a relief leaf surround: GAUDRON APARIS. The centre is embellished by an elaborate engraved scrolled leaf pattern in relief, whilst the time is indicated by a pair of blued-steel hands. Above the XII is a regulation arbor. 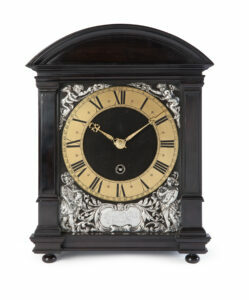 The tortoise-shell veneered oak case of this pendule religieuse has an arched pediment behind which the bells are situated. 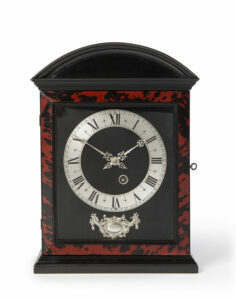 The tortoise-shell veneer is embellished and accentuated by brass line inlays. The glazed front door has a gilt-brass rebate. 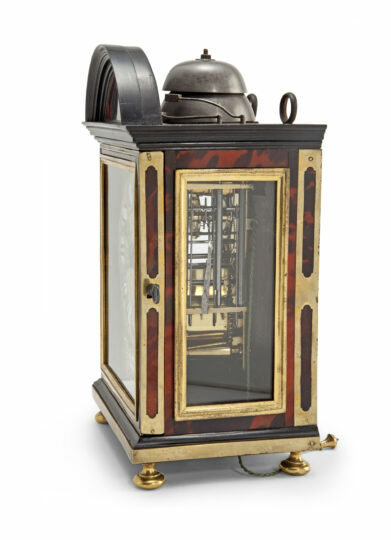 There are glazed windows on both sides through which the movement is visible, whilst at the back there is a door giving access to the movement. The case has ebony mouldings all around and is surmounted has two suspensions eyes at the back. 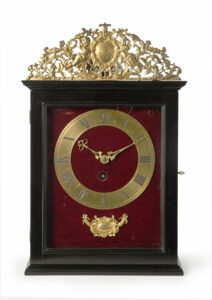 The clock rests on four gilt-brass feet. Tardy, Dictionnaire des Horlogers Français, Paris, 1971, pp. 248/49.